One of my students at Bard, Andy K----, told me he heard a rumor that the US Army was offering sniper training in Halo 3...I'm not an Xbox Live guy so I did some digging on the internet. On the XBL dashboard I've noticed a few little ads of a cross promotion between Halo 3 and the US Army referring to a sweepstakes and Halo 3 Sniper Training video series. I couldn't find the vids located anywhere in the marketplace, just through a clickable ad that occasionally appeared in the dashboard. Last night I accessed the ad, and it took me to a page in the dash that had four videos to download as well as a pic you download to enter the sweepstakes. I DL'ed two of the vids (XBL was running crazy slow so I didn't have time to get them all) and it was really informative. A Halo blog posts directions for finding the vids on Xbox Live. You can find the first of them posted to YouTube. Note the "just like in real life" comparisons. 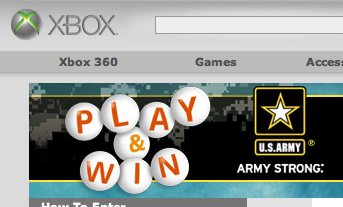 Here's the listing for the US Army Sniper School contest on Xbox's site. This contest is closed, but now there's a US Army Heavy Weapons contest. For both contests, players need to register their gamertag for a chance to win limited edition Halo merch. + An older Army/Microsoft co-lab: A blogger at Gemaga.com posted Microsoft's press release for the US Army's sponsorship of the first Halo Championship Tournament. + Gamepolitics reports back in September 07: "Military Recruiters Snag Underage Players at Halo 3 Launch Bash"
What does it take to be a US army sniper? I'm still debating what I want to do in the Army. I'm wondering what MOS(s) are required mostly, because I don't think a sniper in itself is an MOS. But any information at all on the matter will be of great help. why is the video not available? The Military running armed tactical games? Wonder how long it will be before they start to use this sort of thing for testing skill level and for recruitment? I live in a country where hunting for the weeks dinner is a way of life. I'm amazed at how much a person can learn from games about shooting. Nothing replaces the tactile learning of actually hunting, but the points of remaining unseen, identifying your target and making sure the shot is clear ring true, even on xbox games. Thanks you for the post, great stuff. I have been playing Americas Army for some time. Well I have not for the last few months at least. However it was pretty much the closest game you could get to real life. However it seems that most games have adapted the aspects that once made AA unique. That means that anybody can become a sniper just playing a game like that, I agree the video games are so real these times.